The original castle was built in the fifth century and strengthened by the Moors in 712. 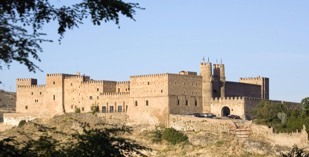 In 1123 it was retaken by Fernando I and El Cid and was converted into a Bishop's Palace. In the late 1800's it fell into disuse and after a restoration which begun in 1964 it opened as a Parador twelve years later. The lounge is the original dining room of the castle. This huge room dwarfs the furniture made to accommodate mere humans with many chandeliers overhead lighting the vast area. The walls are hung with banners and suits of armour are displayed. 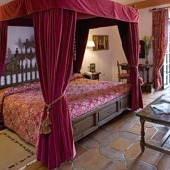 Traditional Castilian furniture is found in the spacious, welcoming bedrooms some of which have four poster beds and a terrace. The views from the terrace may be over the red roofs of the town to the hills beyond or into paved the inner courtyard with it's fountain and well. The restaurant windows look out over the farming land surrounding the castle. Local dishes are on the menu as are international dishes. There is a special gluten free menu. All can be accompanies by a "rosado" a rose wine from the Avila area. In Siguenza, the cathedral is worth a visit. Look for the tomb of Martin de Arce who was a page of Queen Isabella and killed in a battle at Granada. The fifteenth century statue of him reading a book that is above his tomb was commissioned by the Queen. It is called "El Doncel" which translates as 'page' or even as 'young virgin' but here is thought to mean 'beautiful delicate young person'. The church Museum has two good works by El Greco and Zurbaran and a visit should also be made to the sacristy to see the ceiling. Other places to visit locally are the Roman salt mines of Imon, the Roman Arch and the Collegial Church in Medinaceli and the Monastery of Santa Maria de la Huerta. In Siguenza, the traditional festival of San Vicente are held on 22 January. Nearby Atienza has the famous "Caballada" (Festival of Horses) every Pentecost Sunday. Hita holds a Medieval Festival of Hita during the first weekend of July. There are many game reserves to be found in the rural environment which surrounds the Siguenza Parador. The Parador of Siguenza has sixty one twin bedded rooms, twelve rooms with a double bed, five single rooms, two suites and one easy access room. All the rooms have a private bathroom, a telephone, satellite television, TV canal plus, a safe and a mini bar. 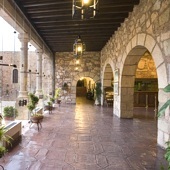 The Parador Siguenza has air conditioning and heating, gift shop, currency exchange, lift, free internet access in communal areas, piped music, satellite television, garden, restaurant, bar and meeting rooms. There are facilities for the disabled. Distance from the nearest airport is approximately 115 kms and the nearest train station is 3 kms away. This is our 5th Parador on our travels. One of our best. Our room was lovely with a view into the courtyard. Lovely place to sit and enjoy a snack. Easy to walk into town but not much to see, other than of course the lovely architecture. The enormous lounge next to the restaurant is one of the most beautiful spaces I have ever seen. Really need to grab a book and sit for awhile. Overall one of our top Paradores. We stayed at this Parador by chance as it tied in with our route. It was really good. Wonderful and unusual building to house a hotel set in a beautiful unspoilt small town. We have tried other Paradores but none so far compare to this one. We stayed in two Paradores - one in Alcaniz on our road trip to Barcelona and at this lovely castle hotel on our trip back to Madrid for our flight home. We were so impressed with both that we are planning a trip back to Spain with friends from the UK who have not traveled to this part of Spain. We have nothing but superlatives for all the staff at both hotels. Siguenza is just stunning and the town is lovely. We will return and take a tour of the Catholic Cathedral downtown. It closed just as we took our walking tour. On a scale of 5 the Siguenza is a 5+. Alison and I have traveled in Europe a lot but staying here was the top experience of our travels. We live in Iowa and love it here but we long to return to Espana. 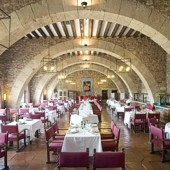 Parador de Siguenza is a hotel in a modernised twelfth century castle.